Here is the remarkable, untold story of how five major Hollywood directors—John Ford, George Stevens, John Huston, William Wyler, and Frank Capra—changed World War II, and how, in turn, the war changed them. In a move unheard of at the time, the U.S. government farmed out its war propaganda effort to Hollywood, allowing these directors the freedom to film in combat zones as never before. They were on the scene at almost every major moment of America’s war, shaping the public’s collective consciousness of what we’ve now come to call the good fight. 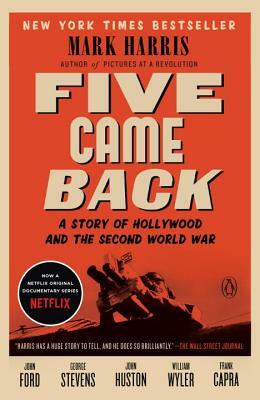 The product of five years of scrupulous archival research, Five Came Back provides a revelatory new understanding of Hollywood’s role in the war through the life and work of these five men who chose to go, and who came back. Mark Harris is the author of Pictures at a Revolution: Five Movies and the Birth of the New Hollywood, which was a New York Times notable book of the year and was named one of the ten best nonfiction books of the decade by Salon. An editor at large at Entertainment Weekly, a columnist for Grantland, and a contributing editor at New York Magazine, he has written about pop culture and film history for many other publications, including The New York Times, The Washington Post, Time, and GQ. A graduate of Yale University, Harris lives in New York City with his husband, Tony Kushner.